Seals, sea lions, and walruses are furry, fin-footed, marine mammals that share a common evolutionary history and are placed in the clade Pinnipedia. Part of the order Carnivora, pinnipeds are divided into three main families: Phocidea (the true seals), Otariidae (sea lions and fur seals), and Odobenidae (walruses). True seals, sometimes referred to as earless seals, include nineteen living species that have successfully inhabited the oceans from the tropics to the poles. Physically, seals have no external ears and hind flippers that cannot bend forward. This means they can’t walk on land but instead roll forward. While swimming, seals swim with a waggle of their hind flippers and lower torso. Most seals “haul-out” on ice to have their pups rather than dry land and wean their pups very quickly, some in as little as 3 weeks. Seals eat a variety of foods, but the bulk of most seals’ diet is fish. The family Otariidae, or eared seals, is not as diverse or wide spread as their Phocidae cousins. The family includes fifteen species of sea lions and fur seals that inhabit the world’s temperate and tropical oceans. Sea lions have distinctive external ears. Their flexible skeletons allow them to fold their hind flippers forward and use them to walk on land. Sea lions swim by flapping their front flippers like wings. 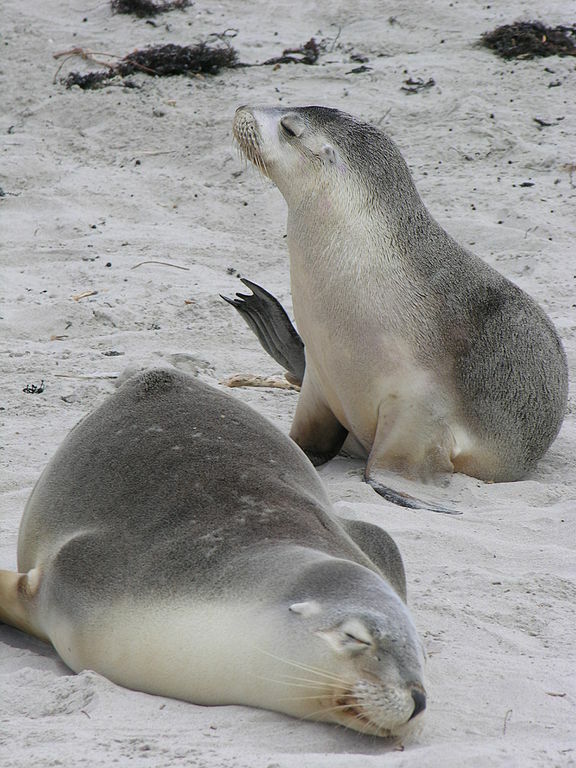 Sea lions (along with fur seals and elephant seals) have distinctive sexual dimorphism (males are much larger than females) and polygamous breeding that occurs on land. The walrus has a mixture of qualities from both the true seals and sea lions. Like true seals, walruses do not have an external ear. Similar to sea lions, they can move their hind flippers forward and underneath their bodies but they cannot bear weight. Both male and female walruses have tusks (large canine teeth). Male tusks are slightly larger than females and can reach almost a meter in length. Walruses have thick, well insulated skin that lacks the visible hair or fur of the other seals. Walruses are the largest pinnipeds in size except for male elephant seals. Walruses eat a wide variety of mollusks found on the ocean floor, and they are largely dependent upon sea ice to provide them a shelf to launch their feeding forays over the continental shelf. The order Sirenia includes three living species of manatee, and one species of dugong. Sometimes referred to as sea cows, these are slow swimming herbivorous marine mammals. Most live in tropical waters eating sea grass. The front limbs are short flippers, and the body tapers to a flat, paddle-shaped tail that distinguishes this species from the related dugong, which posses a fluke-like tail. All of the sirens are endangered, suffering most from boat strikes and habitat loss. The large “Stellar Sea Cow” was probably the first Alaskan species to go extinct because of European colonization. The sea otter is the smallest marine mammal. Dense fur that traps air bubbles (for added insulation) is all that allows them to survive in the ocean’s cold water. They possess a strong, rudder-like tail and large hind-feet that act as flippers. Sea otters have huge appetites and a fast metabolism. They eat a variety of bottom dwelling invertebrates but prefer clams, crabs, and sea urchins. This high metabolic rate help keeps them warm, but it also gives them a position as a “keystone species” in kelp forest communities. The polar bear is the largest living land carnivore in the world today. They are highly adapted for life on the ice. The polar bear is grouped here with marine mammals because of its impressive swimming ability and its complete dependence on the ocean for nutrition. The polar bears are distinctive for their thick white fur, which actually covers skin that is black. The neck of the polar bear is longer than other species of bears, and the elongated head has small ears. Its long extended neck and broad back side gives the polar bear a “boat like” shape. Polar bears have large strong limbs and huge forepaws which are used as paddles for swimming. Click to learn more about the sights and sounds of polar bear life. Select one species from the family Phocidea. Describe the details of their geographic range, feeding strategies, breeding behaviors. Select one species from the family Otariidea. Describe the details of their geographic range, feeding strategies, breeding behaviors. Read through Cary Kuhn’s blog about studying Northern Fur Seals. Describe some of the tools and technology she and her peers are using to better understand why these animals are in decline. Compare and contrast the ways seals (family phocidea) and sea lions (family otariidea) move in the water and out of it. To help you, here is a clip of a stellar sea lion walking, a clip of stellar sea lion swimming, and a clip of a harbor seal moving on land and in water. Today, thousands of northern elephant seals come to the beaches at Año Nuevo State Park to breed or molt their fur. (The link is an active webcam for the beach.) Yet, it wasn’t so long ago that only a handful of these animals existed on a single beach on Isla Guatalupe, Mexico. Watch this KQUED video (YouTube) about Elephant Seals and explain two things you learn about elephant seals. Sexual dimorphism is the physical differences in size or appearance between males and females. Elephant Seals have some of the most extreme sexual dimorphism on the planet. Read the link, describe what you learn. What does a walrus (click on biology) eat, and what does it use its huge tusks for? Click on the link if you want to watch a video of this. “More than just cute, Sea Otters are Super Hero’s of the Marsh.” Read or listen to the story, and then explain the cascade of events that result from sea otters diet choices in the marsh communities of Monterrey Bay, CA. Read the section above about order Sirenia. Describe the physical and geographical difference between dugongs, manatee’s and the now extinct sea cow. Go learn about polar bears here and here. Maritimus is Latin for “of the sea.” Explain how the scientific name Ursus maritimus is a good descriptor for polar bears.